Wheat growers frequently need to estimate wheat yields in the spring in order to make decisions about potential recropping. 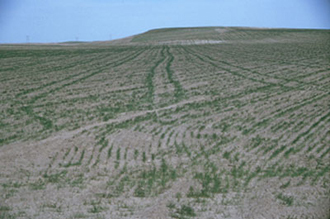 This NebGuide discusses three methods of estimating winter wheat yield. Figure 1. A dry summer resulted in a loose seed bed and poor wheat stands the following spring. Wheat stand and vigor were best in the wheel tracks where soil was firmed at planting. The winter wheat-growing regions of Nebraska are characterized by large fluctuations in weather conditions, particularly temperature and precipitation. Winter wheat often suffers as a result of these climatic fluctuations (Figure 1). Wheat growers frequently need to estimate wheat yields in the spring in order to decide about potential recropping. Determining a reasonable estimate of wheat yield allows growers to predict if it is in their best interest to destroy their wheat and plant a summer crop or leave the wheat for harvest. Before making such a decision, growers should be aware of any restrictions imposed by government programs, crop insurance, or previous herbicide use. This NebGuide will discuss three methods of estimating winter wheat yield. Each method relies on several assumptions that may not be accurate for every season or situation. These assumptions presume that soil moisture and nutrients are adequate, and that weeds, insects and diseases are not affecting yields. Added to the uncertainty of yield estimates is wheat’s ability to compensate for changes in the environment. that there are an average of 16,000 kernels per pound. To use Table I, count the number of plants per foot of row. It is best to use at least 5 feet of row in at least five sites within the field and calculate the average number of plants per foot of row. If the stands are uneven, for example the stand is better or worse in the wheel tracks, make sure your percentage of samples in these areas accurately represents the proportion of these areas in the whole field. Locate the column in the table that corresponds to your average number of plants per foot of row and then move down that column until it intersects with the row corresponding to your row spacing. This is your estimated yield. The second table (Table II) was developed using data collected from 1994 to 1998 as part of the Nebraska Wheat Quality Tour. These tours were conducted near May 1, prior to head emergence in most of the state. Factors such as heavy weed/disease/insect infestations or inadequate soil moisture at the time of the stand evaluation may suggest fewer final heads and a lower yield potential than indicated in the table. *To estimate yields in other Nebraska locations, multiply the table result by one of the following factors: southwest Nebraska, 0.9; central and south central Nebraska, 0.85; southeast Nebraska, 0.75. In addition, the table becomes unreliable in situations of extremely low or extremely high tiller counts, or in years when crop development as of May 1 is well ahead or behind normal. For later season yield estimates, yield predictions can be made by substituting the actual number of heads per foot for tillers per foot. Although these multipliers may appear to be in error — wheat fields in the semi-arid Panhandle usually yield less than fields to the east — on a per-head basis the multiplier is correct. Wheat fields in the sub-humid portions of the state produce more heads/acre, but typically fewer kernels/head than in the Panhandle. For example, if your winter wheat field is in southwest Nebraska and you have an average of 30 tillers per foot of row, and your row spacing is 10 inches, multiply the table result of 40 bushels/acre by 0.9 to get a yield estimate of 36 bushels/acre. Count the number of heads (may count tillers to estimate heads) per foot of row in at least five sites within the field and calculate an average number of heads per foot for the selected field (select sites representative of the field). Determine the average number of kernels/head (the product of number of spikelets/head x number of kernels/spikelet) from at least five heads at each of the five sites. On average, winter wheat in Nebraska contains 22 kernels/head. This average number of kernels/head should probably be adjusted downward for wheat that is doing poorly. How far down is a matter of speculation. Measure the distance in inches between the rows. Average number of heads per foot of row = 750 ÷ 25 (5 foot of row x 5 sites) = 30. Average number of kernels per head = 550 ÷ 25 (5 heads per site x 5 sites) = 22. The row spacing is 12 inches. To calculate the estimated yield, multiply the average number of heads per foot (30) by the average number of kernels per head (22). The result is 660. Divide 660 by 12 (row spacing in inches) to get 55. Finally, multiply 55 by 0.48 to arrive at the estimated yield of 26.4 bushels/acre. No matter which of these methods you use, remember that they are only estimates. These estimates assume the plants are healthy, moisture is adequate, and weed control and fertility meet crop requirements. If you are considering recropping, don’t forget about potential carryover from such wheat herbicides as Ally, Amber, Maverick, CleanWave or other herbicides that may affect recropping options. It is also important to check with your crop insurance provider and the local Farm Service Agency office before destroying your winter wheat field. Figure 2. To determine winter survival of wheat, remove wheat plants from the field, using water to clean the soil away from the roots. Remove fall growth to within one inch of the crown and cut off roots below the crown. 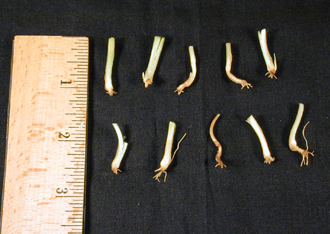 These ten wet crowns are placed in a labeled plastic bag that is inflated and sealed and checked every two days for new growth. Remove the top three inches of soil containing the plant crown (typically located 1 to 2 inches below the soil surface). Cut off fall growth to within 1 inch above the crown and roots below the crown (Figure 2). Place 10 wet crowns in a labeled plastic bag, inflate the bag and tie shut. Check the crowns in two days, rinse with cool water and re-inflate the bag. After four days, the crown should show about two inches of new growth. Some plants may grow poorly and develop molds which live on dead or injured plants. Remember, winterkill can be very localized, so select sample areas carefully and don’t try to extrapolate results too widely. If winterkill is a problem, visit with the appropriate agencies before destroying your wheat crop and carefully plan your alternatives.